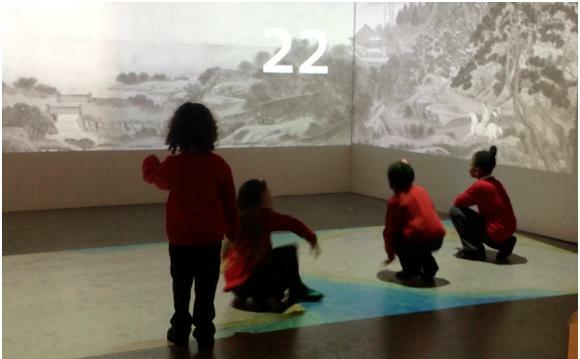 As part of the embodiment research strand at MODE, we’ve recently started a case study looking at children’s whole body interaction with a digital exhibit in a London museum. We’re interested in how children make sense of their movements in relation to the projected visual activity; how the involvement of the whole body in this experience might influence the children’s interpretations of the paintings involved in the exhibit; and how social interactions are configured and coordinated in this type of interactive museum space. We’re also looking for methods of data collection and analysis that help us to answer these complex questions. Our research centres on an exciting exhibit currently on at the Victoria and Albert Museum: ‘Digital Dragons’. The exhibit makes two Chinese paintings ‘come alive’ through digital projection and a whole body interface supported by Kinect devices. Stepping on the floor influences the projection of the painting: depending on where you step, the landscape painting gains colour and human activity and in the other painting, dragons begin to chase coloured pearls. We’ve been observing children as they interact with the exhibit. In a series of naturalistic observations, we videoed 1-6 year olds interacting with the exhibit with their parents. In the next phase of research, we observed 7-8 year olds on a school trip interacting with the exhibit, and then interviewed them afterwards to see how they had made sense of the experience. In-depth analysis will begin soon with iterative viewings and transcriptions. Our preliminary conversations and ideas however, have focused on where the students placed their attention and how, over the course of their experience, they became aware of the relationships between their bodily activity and the projected images. Many thanks to Alex Flowers at the V&A Museum for his support in coordinating this research project. Digital Dragons is based on projections of ‘Nine Dragons’ by Chen Rong and ‘Farewell to Xunyang’ by Qiu Ying. It will be on display in the Sackler Centre until Sunday 16th March 2014.